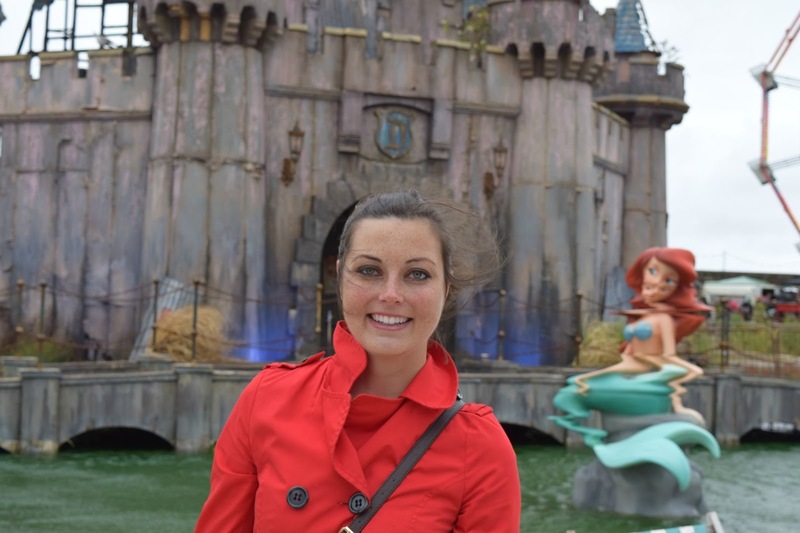 Hi everyone, ever since the news about Banksy’s Dismaland went viral on social media, I wanted to go. Not only am I a big fan of art, but visiting an anti-version of Disneyland, with an arty and society criticising twist excited me for weeks. After a long, draining and nerve-wracking chase for the tickets, my visit happened today and I can’t tell you how upset, angry and disappointed I am. I do mean it honestly and not in the literal sense how the place likes to market itself as being the most depressing place on earth. I am very lazy with regards to anything that requires booking effort. I can’t stress enough how much I despise getting up on a Sunday morning to click refresh every 8 seconds just to get tickets for a festival. The lengths, stress and efforts that people go through to get tickets for certain events and experiences is something I do not share and can hardly understand. So if I sit down and apply for weeks to get tickets for a specific event, this event has to be quite something and worth my time. The Dismaland ticket sale was my worst nightmare. Worse than winning the Glastonbury lottery. It didn’t start on the actual day, causing a mass breakdown of their website. It then got closed for another few days and finally went online on a Tuesday, at a time when everyone was at work and had better things to do than to apply for Dismaland tickets. The ticket slots were only available for the following week, so next Tuesday, the game would start all over again. I didn’t get tickets in the first round, so I applied in the second week for them. I had around 100 tabs open and refreshed them every 8 seconds to get my desired time slot for the weekend 12th- 13th September. To enhance my chances for a ticket I also applied for the slots available on Monday, 14th and Tuesday 15th. After a long and stressful 40 minutes, the first available time slot to pop up was for Monday, 2pm - booked. With four tickets secured for a daytime slot for optimal picture lightening, I was over the moon. With tickets secured I've been on about my trip to Dismaland for weeks (sorry if my excitement annoyed the one or another). If something really excites me, I can be totally happy and smiley about it and to be honest, the opportunity to go to Dismaland has excited me like nothing else has for a very long time. Alex’s stepdad couldn’t come, so I was left with two spare tickets and luckily, my friend Izas and her partner Ashley jumped in. We met at the venue in Weston-Super-Mare. Have you ever been to Weston? Well, it’s not a place I would go there voluntarily. It is a typical British seaside resort. Grim, dull, little run down, sad. 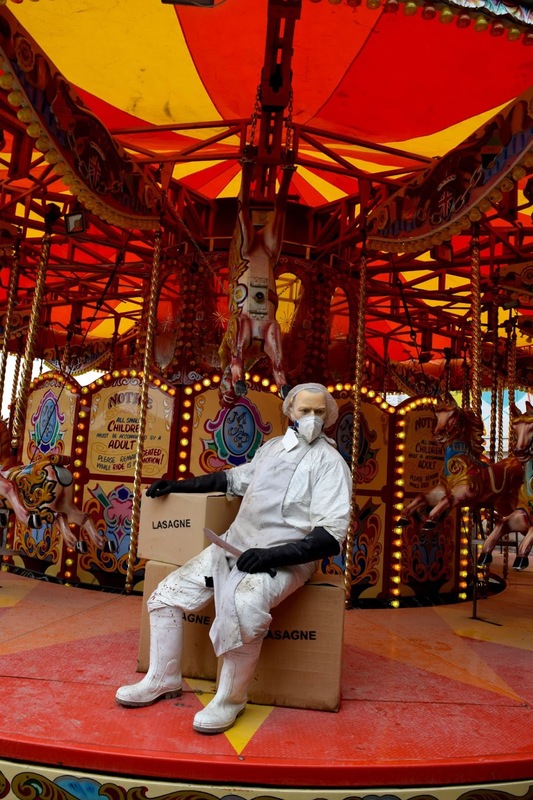 The perfect place for Dismaland. The weather was equally grim. It rained heavily on the way and at some point, I had to slow down to 30mph because the rain was that nasty! Dismaland is not signposted but if you follow the signs to 'beach' and 'seafront south' the posts lead you directly to the place. Parking spaces are provided just outside and I found one in the front row. Although we had pre-booked tickets, we had to join a 40-minute queue in the rain and the cold. At 2:10pm we finally entered the park, 10 minutes after my booked time slot at 2pm. A stream of people carried me into the park straight to Cinderella's castle. After weeks of seeing Dismaland on the internet, it became now a reality for me. There was a lot going on and so much to see that it was hard for me to decide, where to go first. It felt surreal standing finally in front of the distorted Ariel. I then spotted the bench with the bird lady and a grumpy park staff, so I had to take a picture with him, too. Please click on the panorama to enlarge the picture. It went all downhill when strong winds knocked Ariel over. That was the breaking point of the park going mental. The rain went down, the air got colder and the staff announced the closure of the park for ‘safety reasons’. At first, people thought this was part of the show and a joke. But it wasn't. At 2:40 staff pushed people out of the park. I felt very confused as this scenario has never been mentioned on the ticket or that the park would reserve the right to close it down if security due to the stormy weather became an issue. You would have thought that the organiser would have been prepared for such an emergency, given the fact that the park has been built directly by the sea, which can get rough. During the evacuation, the staff stayed in their dismal character, which I found inappropriate given the situation. They would not offer a refund nor give information who to contact regarding this. Cinderella’s Castle was closed in seconds. People were disappointed and angry and in a slight panic when everyone realised this wasn't a joke. Staff pushed the crowd out and suddenly everyone stormed for the exit through the gift shop (sorry couldn't help this pun). Such a nightmare! 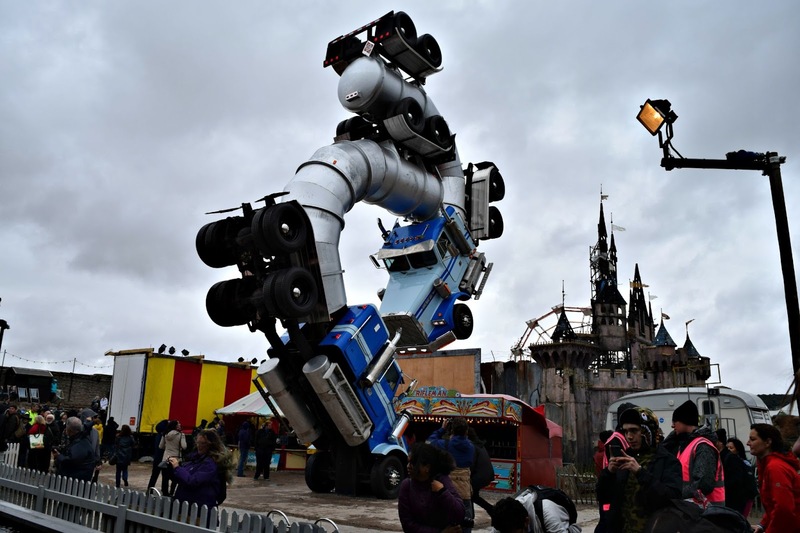 My entire stay at Dismaland included a 40-minute queue and 20-minute stay at the park, 10 of those squeezed up in a crowd of people on the way out. During that time, I could not experience the art nor appreciate the social criticism portrayed by the exhibits. I wasn’t able to see the centrepiece Cinderella’s carriage, nor the porcelain dancers nor the Mickey Mouse Snake hybrid and so on. My stay was completely rushed and I feel this day has been wasted. 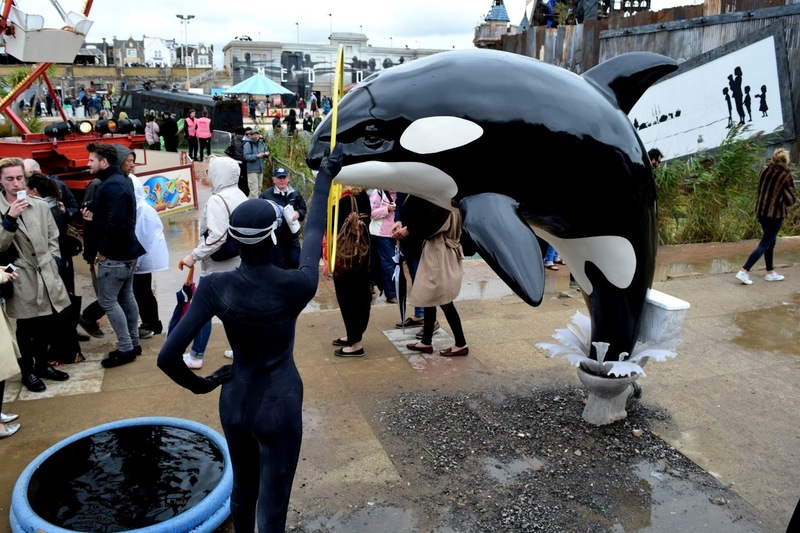 I didn't receive a refund nor any other compensation for my loss of time and experience at Dismaland. 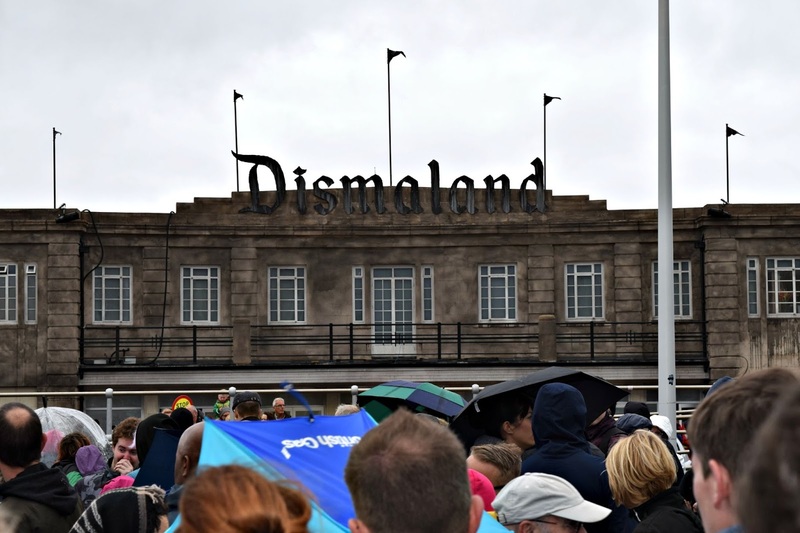 I do get that Dismaland is a place to criticise amusement parks, in particular, Disneyland for being corrupt and money greedy, and also wants to confront visitors with our distorted images of society. The staff is meant to be unhelpful and grumpy, the park itself is meant to leave you dismal and upset. Well, it certainly has. I came back home crying because I was angry about how the place handled the situation. Security comes first but they didn't make any move towards a contact person or what's going to happen. People invested time and money to travel to see that once in a lifetime masterpiece of art and then they don't even have the respect to offer anything? They even had the audacity to still charge £5 for their tour guides. We made our way into town to find 'somewhere nice' for tea and coffee. However, this is Weston, and finding a place was hard. We ended up in Nero's and had some cake and a hot chocolate. Unfortunately, both couldn't restore my world. I may sound overdramatic here, but I get very sulky and moody if I feel frustrated, uncomfortable and upset, and that was definitely the case. This day was meant to be special and also a little treat for my friends and family. I'm not a person who can brush things like that off easily and be all smiley and happy when things go wrong. So I'd really like to apologise to my friends who had to see me so devastated and cope with my miserable self. Before we left, a few people tweeted me kindly, that Dismaland potentially-maybe re-opened in the evening. Well, staying until then wasn’t an option, because Alex's mum has two dogs at home which we didn’t want to leave for 8h+ on their own, plus it had a reason, why I wanted to see Dismaland during the daytime. When we left at 5pm the winds got even stronger, so I don't think anything would have changed later on. Only by accident did I come across this account on Twitter. I shared it on my feed and hope, other visitors that day have seen it. I've asked a few times if they can let me know any contact details for the Dismaland management or the organisers, as there is no information given on the official Dismaland website. They hide somewhere and completely ignore the fact, that this is a serious customer issue. Like many other people who visited that day, I can't make another trip to the park. I don't live in the UK so a return to Weston within the opening period of Dismaland isn't doable for me. I know Dismaland is all 'lols dismal' but given the situation, they should take their customers seriously. After all, the artists accuse Disneyland to be a company full of corruption, manipulation and greed for money. I really get mixed messages here, for what Banksy's amusement park stands for and what it actually practices. This has nothing to do with art anymore and please decide for yourself if you feel a trip to Dismaland is worth your time and money. 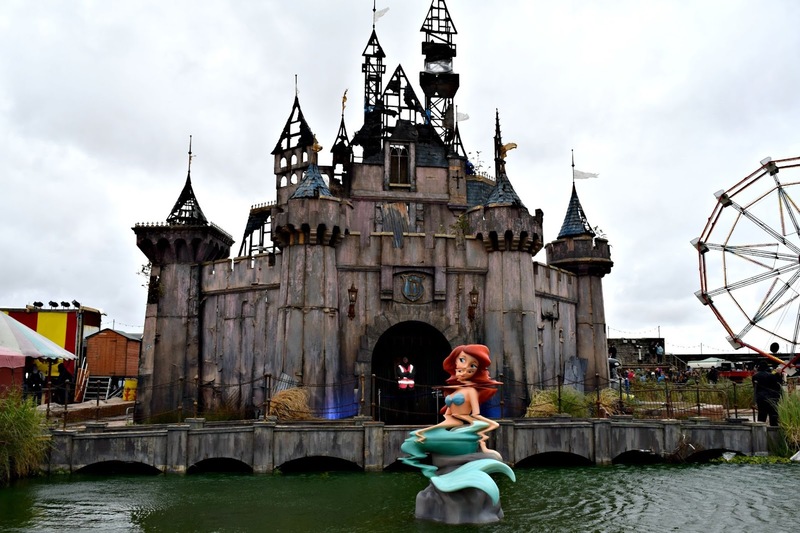 16/09: I still haven't had any reactions from Dismaland's management or the organisers regarding a refund for my non-existent experience at the park. 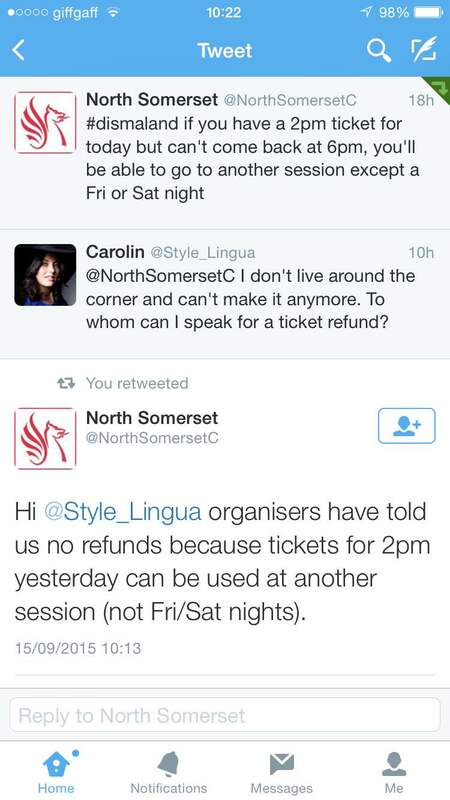 I've tweeted a few times to the North Somerset account to please let me know any contact details, but it comes as no surprise, that they've been ignoring my requests. Cleverly, there's no contact information given on Dismaland's official website. 30/09: The North Somerset Council kindly gave me a contact email address for Grey Fox Productions, the organisation that ran the Dismaland Event. As of today, I've had no reaction from their side, nor a refund. It is very obvious, that the organisation hides somewhere behind a big name and does not want to face any issues with the park. This makes me question what would have happened if on that day someone really got hurt in that storm. They would have completely ignored and brushed that off as well. 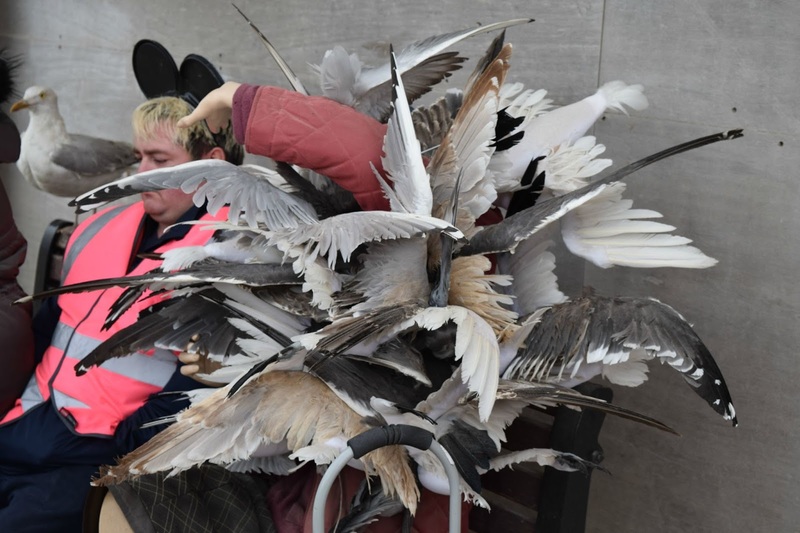 I've never come across such a poorly organised event ever and after all this, Dismaland remains a total scam to me. It's a profit machine run by greedy people that call themselves 'artists'. Thank you so much for reading today's post and I'm sorry it has had a slight upsetting undertone. I can't help it. I'm probably fine tomorrow but for now, I can't express how disappointed I am. I feel robbed of my time and the opportunity to experience the exhibition. I wanted to see Dismaland and experience it to the fullest, yet it has been a rather surreal and upsetting afternoon for me. I've missed out on an experience which I didn't want to miss out on. Life certainly isn't a fairytale but I didn't need Banksy to tell me this. I knew this already.